It would have been nice to know the hotel was under construction. All food and beverages. Land activities like volleyball and tennis. Onsite entertainment and language classes. Children's pool. Area shuttle. All food and beverages. In-room minibars with all drinks. Land activities like volleyball and fitness facilities. Onsite entertainment and aerobics classes. Children's club. The staff was very helpful, rooms were clean and accommodating. We don't do all-inclusive and the staff was very helpful were dining, shopping,and entertainment suggestions. We felt very safe in Mazatlan. We'll be back. Terraced above a long crescent beach fringing Emerald Bay, this family-friendly resort lies in little-developed Nuevo Mazatlán, 9 km (6 mi) north of Mazatlán's hotel zone. Located in Zona Dorada, this resort is within 1 mi (2 km) of Punta Camaron Beach, Sea Shell City Museum, and El Cid Country Club Golf Course. La Gran Plaza Mall and Plaza de Toros are also within 3 mi (5 km). Facing Bird Island on the north end of Mazatlán's Golden Zone, the all-suites, hacienda-style Pueblo Bonito Mazatlan - All Inclusive offers family-style vacations in a casual atmosphere. All inclusive vacations don’t have to come with a high price tag. 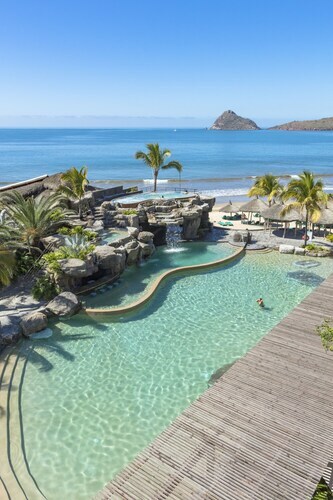 Travelocity is here to help you find the best deals on all the top all inclusive resorts in Mazatlan (and vicinity) so you can spend more time relaxing in the sun, and less time worrying about how much you’ve spent. 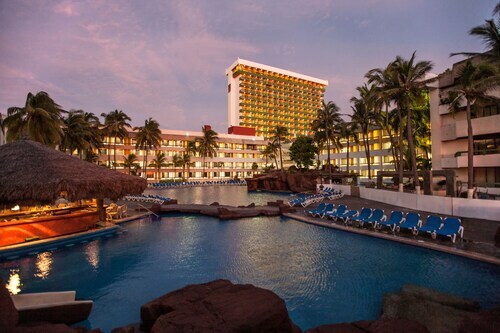 Get the most out of your stay with our deals on Mazatlan (and vicinity) all inclusive hotels! Pueblo Bonito Emerald Bay Resort & Spa - All Inclusive: has a guest rating of 4.40 out of 5 stars. Emerald Estates - All Inclusive: has a guest rating of 4.00 out of 5 stars. 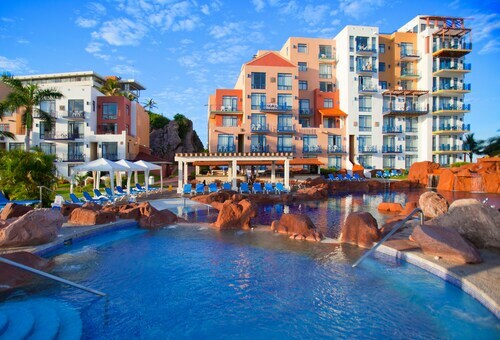 Pueblo Bonito Mazatlan - All Inclusive: has a guest rating of 4.20 out of 5 stars. 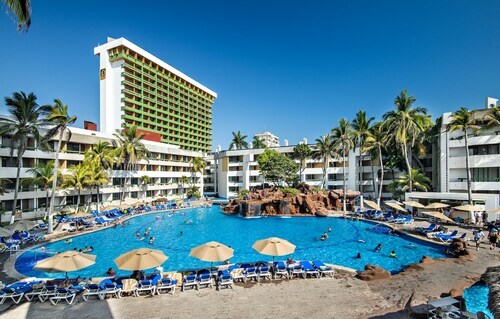 Hotel Playa Mazatlan: has a guest rating of 4.10 out of 5 stars. Riu Emerald Bay All Inclusive: has a guest rating of 3.90 out of 5 stars. 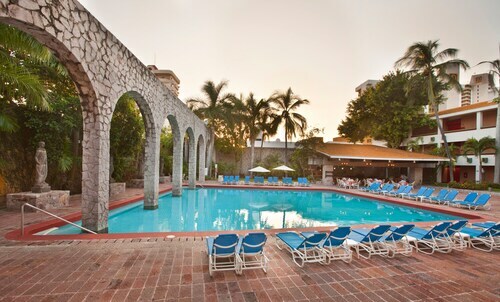 Book affordable rates at El Cid Marina Beach Hotel, which has a rating of 4.50 out of 5 stars based on traveler reviews. Book affordable rates at Pueblo Bonito Emerald Bay Resort & Spa - All Inclusive, which has a rating of 4.40 out of 5 stars based on traveler reviews. Book affordable rates at Pueblo Bonito Mazatlan - All Inclusive, which has a rating of 4.20 out of 5 stars based on traveler reviews. Our trusted ratings and reviews from guests help you book your stay in Mazatlan (and vicinity) all inclusive resorts with confidence! With over 16 hotels and resorts to choose from, you’re sure to find the perfect destination for your next trip. My wife and I stay at Playa Mazatlan was wonderful. Our room with the ocean front was delightful. The service the staff give our was most accommodating. We took advantage of the All Inclusive package where the food, drinks, live shows, and plus a tour were included. It was wonderful to have a drink when ever we liked. The evening shows at the Venado were 1st class. And after, we danced to a live brand that played some of music from our youth. The areas I think needed improving: the fresh fruits, stronger coffee, food in general (the food they served at The Shows seemed better to me). Different bands for dancing. same band sang the same songs every night. Verify is better forme. The hotel staff were always glad to help if we ever needed anything and took the time to answer any questions we had. Thank you! Very quiet and peaceful. Very friendly staff. Only issue was limitations with the all inclusive. Such as having to sign a receipt for each and every meal and bar tab even though it was part of the package. Fridge not stocked with water, soda or beer. This is the 4th Riu we’ve stayed at and it was just as great as the others. The staff go out of their way to make sure you are taken care of.